Hi everyone, hope you are having a lovely week? Time always seems to fly when the kids are off school!! The weather has been great here the last few days. The sun has been shining and it has been really warm. Although I am sure it will not last. Really hoping it does last the rest of the holidays. At least it gets us out of the house and burns a few calories. It has been great for encouraging my children to be fit over the holidays. Our hard work is really paying off, we are feeling fitter than ever. At least the kids are! They are really tiring me out though. All this exercise they are getting me to do is unreal. Personal trainers are no match for children!! Nearly 5 hours exercise yesterday. You name it, they drag me along to play or watch. Which is lovely but hard work keeping up? I am sure this was easier 10 years ago when my two eldest children used to have me doing the same! With Winter hopefully now gone until next year. I had been on the lookout for a new Spring jacket for me to wear when the sun goes down or there is a chill in the air. I love to be warm. 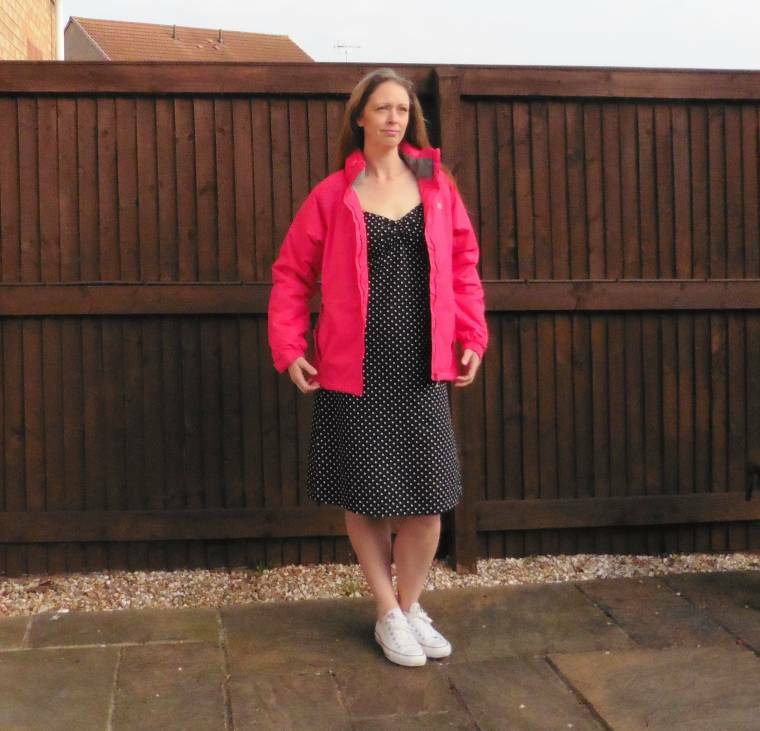 I needed a lightweight jacket with the caveat that it was warm and waterproof. Or at the parks with my youngest two, or something to throw on in-between exercising the children or just on the sidelines watching them play! It had to be suitable for caught out in the April showers too. I also hate clothes that get soaked in the rain. A lot to ask then? Perfect timing for Trespass to ask me to share my thoughts on their Kona Waterproof Jackets then!! Elasticated cuff with hook and loop tab. As soon as I opened my parcel I could tell the jacket was high quality. You can tell this just feeling the material, lining seams etc. 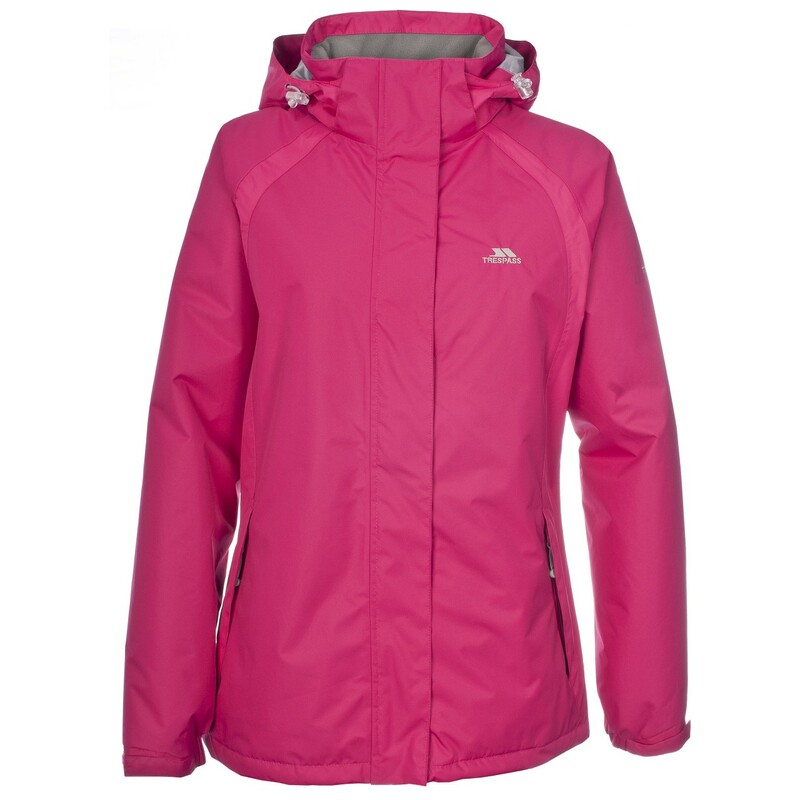 A perfect jacket for spending lots of time outside walking, taking the dogs out or anytime outside for long periods where the weather is changeable. Ideal then for the UK. I picked a size small and it is a lovely fit for me. I would say the small is a nice fit for a size 10-12. The two pockets on the outside and one inside are a great addition. Keeping my key and spare change safe. I am not one for hoods on jackets, however, one hidden away just in case is a welcome addition. I will say I don’t like a hood, yet I like getting my hair wet even less! Colours available Cornflour blue, Cassis pink, Spa blue and Wildberry. Price Was £69.99 now £26.99. 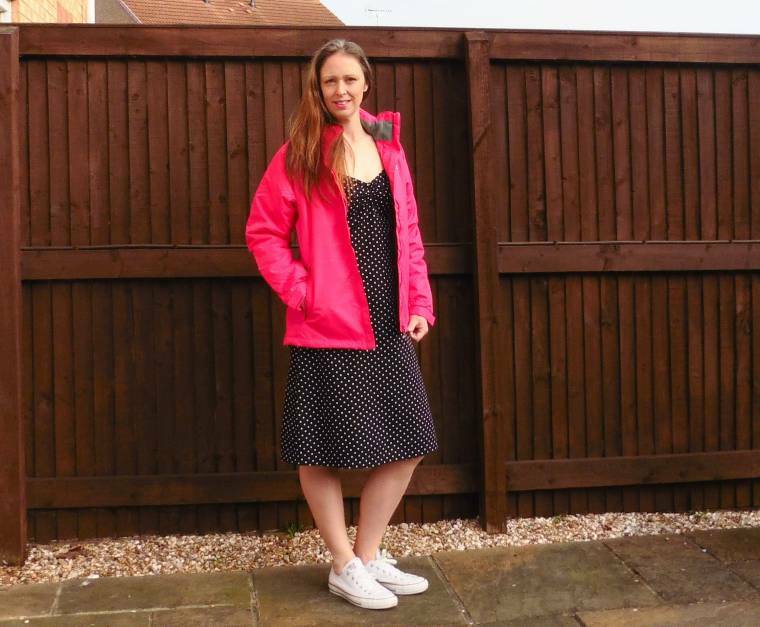 I have Been gifted a jacket from Trespass to review and share my thoughts. All thoughts are my own honest opinion and I was not paid for this post. Check out my latest style posts here: Fashion. 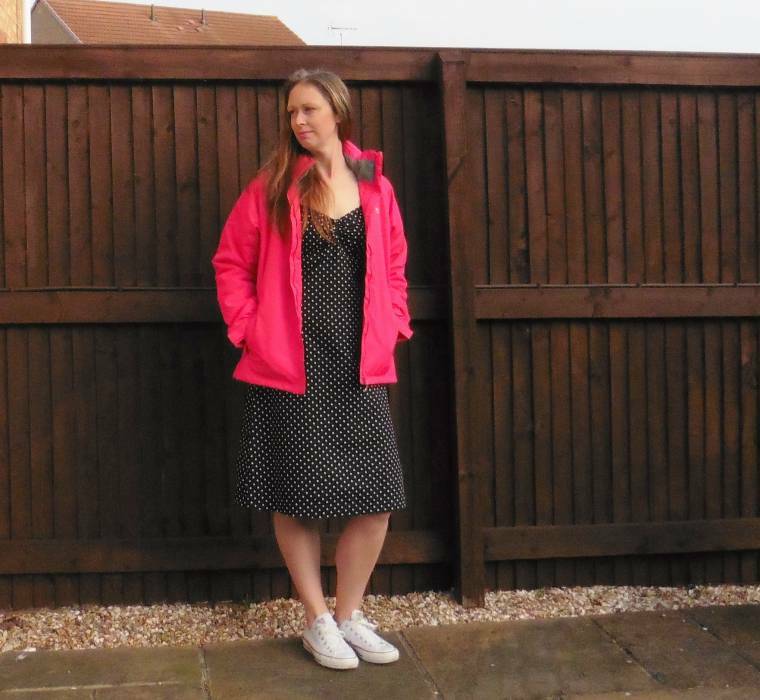 Love how casually-pretty the polka dot dress looks with the rain jacket and white sneakers. That pop of red is perfect. I love the jacket so much! Happy Thursday Claire! Thanks Ada, hope you having a lovely weekend!! This is so cute! Love the color! It's hard to find the right spring time jacket. Thanks Heather, I know. 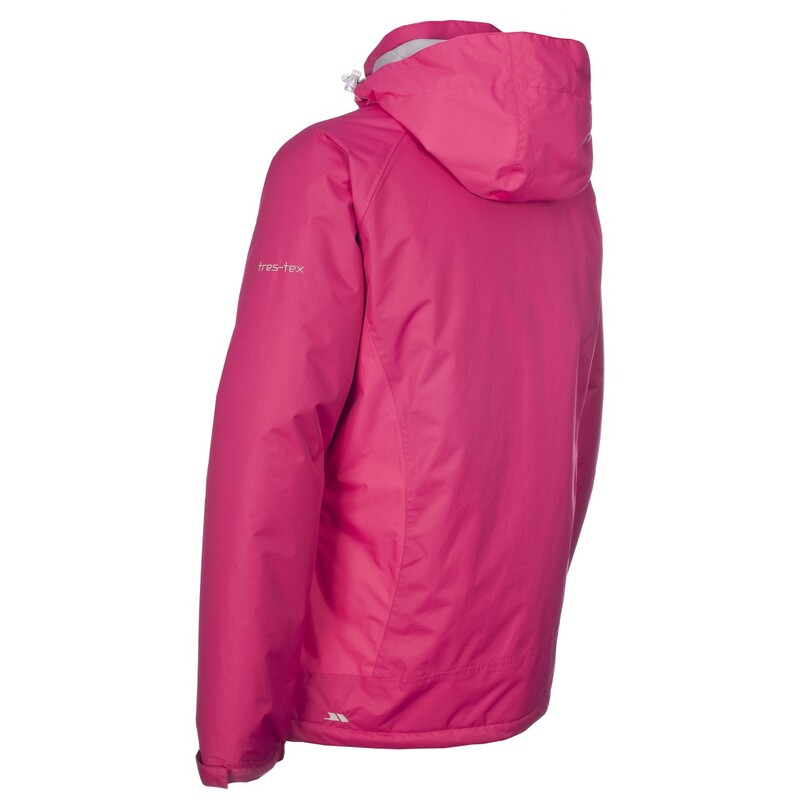 Trouble is the weather is so changeable..
Great jacket …love the pink !! !